KAHULUI – Civil Air Patrol pilots and former members called for the reinstatement of the now-disbanded 57th Kahului squadron during a heated town hall meeting on Monday at its former Kahului Airport headquarters. The facility is now occupied by the 76th squadron, formerly a smaller Kihei unit that was sanctioned in 2009, but had no airplane or facilities. The two squadrons merged last August in what Col Jeff Wong, commander of the Hawaii wing of Civil Air Patrol, calls a “realignment” of the two Maui squadrons. 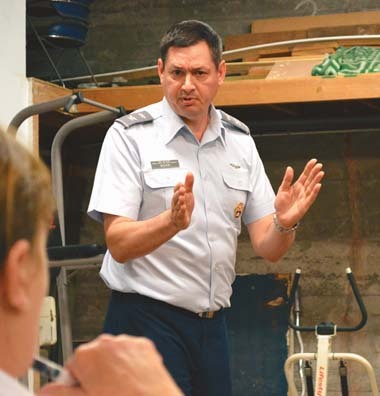 But some members described the changes as a retaliatory dismantling of a longtime, fully functioning, mission-ready unit, Maui Composite Squadron HI-057. After the merger, the new Maui County Cadet Squadron retained the charter number of HI-076, and took over the Kahului Airport facility that had been the home of the 57th squadron for the last decade. Several senior members, some of whom had been with the unit since its founding in 1974, said they were involuntarily transferred to either a squadron on Oahu or a “ghost squadron” for inactive members. Maj Bobby Hill, a pilot who had been commander of the 57th Kahului Squadron until last March, said Wong removed members from the unit, in some cases after clashes with Maj Eduardo Zayas, who was appointed vice commander of the Hawaii wing of CAP under Wong in November 2013. Hill, who lives in Waiehu, is currently assigned to a cadet squadron at Maryknoll High School on Oahu, along with two other senior pilots formerly with the Maui Composite Squadron. On Jan 30, Hill petitioned to join Maui’s squadron, HI-076, but said via phone Wednesday he has not received a response from the Hawaii Wing commander. Hill said Zayas “immediately started to abuse his power” after being named vice commander. Several of the 11 former members of the 57th squadron who attended the meeting Monday accused Zayas of bullying and intimidation, deleting personnel records and certifications and threatening to “kick people out” when they disagreed with him. “He sent emails to people to tell them they were relieved of their command without even sitting down with them,” Hill said of Zayas. Repeated complaints from members to Wong about Zayas’ leadership were never addressed, Hill said, adding that he has filed a complaint with U.S. Sen. Mazie Hirono’s office that is still pending. Disciplinary action was not taken against Zayas until a criminal case was filed against him in 2nd Circuit Court earlier this year, CAP officials said. Zayas, 62, of Kihei was arraigned in January on a felony charge alleging he forged another pilot’s signature on a document to indicate Zayas was qualified to fly cadets on orientation flights – which requires a higher level of pilot certification than he has, The Maui News reported then. The date on the forged flight evaluation form was Nov 11 2013, according to court documents. Zayas has pleaded no contest to third-degree forgery of a flight evaluation form, a misdemeanor. As of Monday, Zayas was no longer a member of the Civil Air Patrol, according to Col Brian Bishop, commander of the Pacific Region that encompasses Hawaii, Alaska, California, Nevada, Oregon and Washington. Bishop attended the meeting on Maui to listen to concerns from cadets, the community and former members of the 57th. “What I’m hearing is Zayas was a bad guy, and Wong let him be a bad guy,” Bishop said. He said he agreed that Zayas was “a bad guy,” but did not know if Wong violated any charter rules that would prompt his removal from duty. Hill called for the removal of Wong from duty for enabling Zayas to “abuse his power” and “turning a blind eye” to complaints that had been brought to him against Zayas, but Bishop said he could not just remove the Hawaii Wing commander on a whim. In July 2013, the Civil Air Patrol and the U.S. Air Force conducted a compliance inspection of the Hawaii Wing, as they customarily do every four years. The inspection turned up 86 discrepancies and earned the Hawaii Wing an “unsatisfactory” grade. Wong was given eight months to correct the discrepancies and bring the wing into compliance with Civil Air Patrol regulations and standards, which he did, Bishop said. In a follow-up inspection last March, the discrepancies had been reduced to zero, and the wing was awarded a “successful” rating. “So on a national scale, it looks like Wong is moving the ship in the right direction,” Bishop said. “An operational CAP squadron is much more than an organization for members to pass a couple of hours once a week,” Wong said, adding that he deactivated the 57th because its level of active participating members had fallen to a point where the squadron was no longer able to safely supervise cadets and carry out its congressionally mandated missions, which include aerospace education, cadet programs and emergency services. “If the 76th squadron grows large enough, and enough of those members want to form another unit, it is a possibility,” Wong said. But members said Monday that the 57th had never once missed a mission and should never have been disbanded in the first place. “They had no reason to close us down,” said Lt Col August Leval, who has been a member of the Civil Air Patrol for more than 52 years and helped organize the Maui Composite Squadron, which was chartered in 1974. Leval said that as of December 2013, CAP records showed 25 active senior members in the 57th squadron and an additional 22 cadets, a “strong” membership for any Hawaii squadron. “So if they say we didn’t have enough squadron strength, that’s BS,” Leval said. Those numbers dwindled “systematically” under Zayas’ leadership before the merger in August 2014, Hill said. Membership numbers were not available for August 2014. A request Wednesday to the 76th squadron commander for current membership numbers was not immediately returned. Leval added the squadron graduated several cadets over the years who went on to attend top universities and garner military honors. The 57th squadron assisted in the search for Eddie Aikau after the Hokule’a voyaging canoe capsized 12 miles south of Molokai in 1978; for three University of Hawaii scientists aboard the vessel Holoholo that disappeared in 1978; and for five friends aboard the Sarah Joe when it disappeared offshore of Hana in 1979. “We helped them start (HI-076) in Kihei, only to turn around to disband us and take our facility over,” Leval said. “The desks here, the paint on the walls, we built that. They took it away from us and gave it to 076; do you think that’s fair? I’m worked up about the fact that nobody stepped up to the plate and helped us,” Leval said. 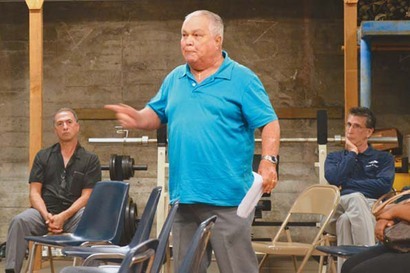 Wong, Leval and several others said they would be willing to share the Kahului Airport headquarters with the 76th squadron – possibly having their weekly meetings on alternate nights – if the 57th were to become reinstated. Be the first to comment on "Turbulence in Hawaii Wing"